Barcode Producer, an application aimed at graphic designers and other visual creatives who need to incorporate bar codes into designs, such as for coupons or product labels, has been updated to Version 5.5. 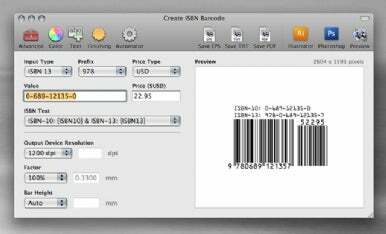 Barcode Producer helps you generate barcodes commonly used in retail packaging. Barcode Producer includes a "Symbology Guide," which helps users find the correct type of barcode to use in a design, and a Live Preview, as well as easy export to EPS or TIFF formats. You can use Barcode Producer to add borders, margins, colors and other embellishments, then transfer those designs directly to Adobe Illustrator or Photoshop. Version 5.5 adds trim marks, support for grayscale EPS, an ISBN check digit calculator, as well as an updated Symbology Guide. Updates from Version 5.0 or later are free; Barcode Producer 5.5 is $199 and requires Mac OS X 10.4 or later.